Firstly this post is dedicated to my beautiful family who have shown me the ability to strive through adversity and to maintain my smile and sense of belief – no matter what hurdles and obstacles are placed before me ! So here we are – my first book review on my blog and boy what a book I selected. Well let me start with how I got this book. I ordered this book along with three others from Amazon around late June and when the shipment arrived I had a choice of which one to read, but as I had heard alot about Clark and had the fortune to interact with him via twitter and had sometimes seen him tweet some things about a chat he joins on a Friday mornings, I thought I would go with him. So I picked it up and glanced at this book with this big RED hand holding what looks like a book (manifesto?) – I gave it the once over and then I put it down. Then one day, while I was travelling to town via our reliable and beautiful Victorian Public Transport system, I decided to start reading it and that’s when it hit me – as my mate Jackie Gleeson would say “Pow right in the Kisser”. By the time I had reached my stop at the bottom of Kings St and Lonsdale St, I was furious, I was angry. I was hit by yet another Manifesto (by this stage I had read and dismissed the eLearning Manifesto) which is all I really needed ! I thought who is this guy – he is accusing me of not doing my job properly. Who is this guy sitting all the way in his cushy office in the US somewhere who is telling me that the last 15 years of my L&D life have been to no avail. I was not going to let this guy get away with having a go at me and my mates in the L&D profession. So first point of warning – be prepared to be confronted, to be challenged. In hindsight, this ends up working well, but to have this thrust upon you in the first few chapters of the book does knock you about. So what did I do – I tweeted Clark and expressed my view. I won’t bore you with a copy of the exchange but the upshot is that Clark responded in a positive and constructive way and challenged me to keep on reading and to give the book a go. It was then that I realised what a great guest Clark would be for my #ozlearn tweet chat – I thought also as the book had just been released it would also benefit Clark in promoting his book in this region – so I organised to interview Clark (due to timezone differences he could not join us live). After overcoming my issues with Google Hangouts I succumb and reverted to Skype and recorded an interview with Clark (which you can see here) and this was used for our September #ozleaarn tweet chat. So I kept on reading – The first 6 chapters are a reflection on what Clark classifies as the “Status Quo” and “To Hand” respectively – good chapters that cover the current state of affairs of our L&D world – from our industry to neuroscience and the state of our organisations and technology. Now you can read these if you wish, but if you wish to skip and come back to these later you can without major loss of continuity. But if like me, you really want to know what to do and do now, jump straight to Section 3 – this is where the book really starts to “kicks goals”. The framework presented is well structured and articulated reflecting on the need for L&D to play the strategic role required and to be measured against valid and key business outcomes. Chapter 8 demonstrates how this may look like via some real life case studies. Clark “leans” on his friends in the industry to provide him some very good and detailed case studies – Mark Britz, Allison Anderson , Charles Jennings and Clark also refers us to a few assessment tools that will assist us to determine where we may be at – I liked the eLearning Maturity Model from Towards Maturity the most. L&D’s role will shift to facilitation and curation, with a much diminished role of creation and presentation. It was at this point that I finally appreciated the purpose and role of this book – I realised that Clark not only challenged and confronted me but he was willing to help me – he had offered me a way forward and he was now going to show me how to implement. Chapter 9 was great – it brought all the pieces together into what Clark termed a “Re-Think”. Here he outlined the need for a performance strategy, influencing the culture of learning and the rebadging of L&D to Performance and Development. Clark points to the LPI Capability Map as a tool to allow staff to assess against the skills required “for an enlightened approach to L&D”. – Marc Rosenberg who challenges the L&D profession to do more to develop “solid value propositions for L&D” . He also notes that although L&D is embracing informal learning, performance support and social learning, “we don’t have any idea on how to sell and implement these across our organisations”. Both reflections are to the point and clear on their views on the state of L&D ! Allison and Marc have added enormously to Clark’s book – great initiative Clark to include these two “giants” of L&D. Section 4 (the last section) is the icing on the cake. As a firm believer of the craft of Performance Consulting and one which I believe is not practiced widely, I was so glad to see Clark make this his platform for Section 4 and dedicating a whole chapter to this skill and process. His Design Decisions flowchart captures the process in a nut shell and one wonders why do we sometimes make things so hard for ourselves and over engineer everything – Clark simplifies this for us in 8 easy to follow steps. Another section that resonated with me was that of Evaluation and Measurement. I recall Clark stating on our #ozlearn video interview (see link above to video chat) that Kirkpatrick is not dead albeit what some may say. He asks us to flip Kirkpatrick around and start with the end in mind. I was so glad to hear this as this was a practice I had already adopted in my previous extensive evaluation work and the core premises of the Evaluation of L&D Framework I developed for a large public service organisation in Australia. 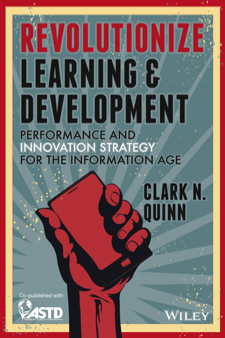 One thing that did stand out for me from this chapter (and the whole book) was that Clark did not reference at all Return on Investment (ROI) as a strategy or suggested approach to determine the value add of L&D. Whether intentionally or not, this to me sends a clear message to the profession that such measurement techniques are either no longer valued or required by the C-Suite – but rather Learning Impact Measurement as advocated at a recent seminar by Nigel Paine is more the way to go in reporting the value of learning and the impact on business. Clark concludes the book by taking us back to where he had us in Chapter 1 – challenging us to do things differently, “stop doing what we are doing in a vacuum”! He stresses to “stop being order takers” and start to be performance consultants, and he asks us to sign up to the Performance and Development Manifesto. Yes I had reacted earlier in having another manifesto shoved in my face, but as I reached the end of this book I came to realise that this one was different, this one was going to make a difference – it challenges us to do things dramatically differently; it asks us to think of our roles in a more effective and efficient way; it pleads with us to not continue to develop for the sake of developing but to curate and facilitate; it implores us to chose performance support over training; it invites us continue to evaluate and measure ourselves and finally it encourages us to continue to explore and innovate. Thanks Clark for an inspiring book. On a personal note and upon reflection, I know our initial twitter exchange on the book may not have set the right tone but credit where credit is due – your book did resonate with me and had an impact on my thinking. It also is very timely, as we see from the recent Towards Maturity Benchmark Report that L&D is seen has having an over reliance on eLearning and technology without much thought been given as to whether it is the right solution. Performance consulting and curation skills, two of the key skills and approaches you have recommended, are still not evident or underdeveloped in our L&D departments. I am hoping that books such as yours will assist us all to step up and be part of the “revolution”. I highly recommend this book to all L&D/ OD professionals. and his Revolutionize L&D Linkedin group. The book is available now on both Kindle and Paperback – click here. * This reviews was based on the paperback version of the book. Thank you for sharing this Con! I’ll be adding it to my reading list. Thanks for a comprehensive review Con, sounds like one worth reading. Loved the story behind it too & your initial reaction. Often the best learninv emerges when our beliefs are challenged – and when we approach this challenge with an open mind. Good on you for persevering with it. The case studies sound really interesting.